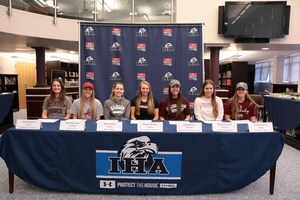 Seven IHA seniors committed to their future colleges on Tuesday, March 1. The girls will all be staying on the East coast the next four years as they signed to schools ranging from New Hampshire to Pennsylvania. Swimming and lacrosse both had two athletes participate in Signing Day. Lacrosse player Rebecca DeRosa signed to Rensselaer Polytechnic Institute and her teammate, Olivia Remley, committed to Babson College. Kristin Kunnapas will be swimming at Fairfield University next year while Katherine Ustorf will be making waves at Susquehanna University. Sarah Siclari signed to Muhlenberg College for softball. Annabel Reyes will be spiking volleyballs at Farleigh Dickinson University next fall. IHA is proud of all the seniors and wishes them luck next year!